Not quite ready for Swan Lake. Some people think they were born at the wrong time; adventurers wish they had lived in 900 AD when Vikings sailed the seas, and fleshy women yearn for the 1600s when their bodies would have been the feminine ideal in Rubens’ paintings. I’m fine with the current time, but think I was born into the wrong movie. My life is a Low-Budget Documentary, interspersed with Tear-Jerker Drama and Slapstick Farce. I should live in a Hollywood Musical. In a Hollywood Musical, it’s perfectly acceptable to break into song (and/or dance) at the least provocation. When you do that in real life, people look at you strange. Believe me, I know. And while it’s great that under Obamacare my insurance will pay 100% for mental health counseling, I don’t think I could swing the $6750 deductible if I were committed to the psych ward. When I was a teenager I saw “Fame,” a gritty musical about the trials and tribulations of students at a New York high school for the performing arts. I came out singing and dancing, yearning for stardom. My high school taught useless stuff like History, Algebra and French. The “Fame” kids took cool classes, like Dancing On Cars and Legwarmers 101. Clearly, my parents’ lack of foresight in not being gritty New Yorkers torpedoed my chances. I know I would have shone in our high school musicals, but I wound up in the orchestra pit, fumbling through the impossible scores of Broadway classics like L’il Abner and Guys & Dolls while gazing longingly up at the stage where I rightfully belonged. Some might say my lack of high school stardom was my own fault, primarily because I was too chicken to actually try out for any parts, but as a crucial pillar of the band, I felt it was my duty to support the teacher, Miss Fletcher. Talent thwarted yet again. I can carry a tune – at least I think I can. But, surprisingly, nobody has ever urged me to chuck this work-a-day world and head to Broadway. I can dance, too – if we count the Bee Gees-inspired gyrations that take place in my living room and at weddings after a couple glasses of wine. I’m not classically trained, though. With 9 kids to tend, Mom concentrated on getting food on the table more than schlepping us to extra-curriculars like dance lessons. I gathered my courage and signed up for beginner ballet when I was 16, and at the very first lesson I was clearly head and shoulders above the rest of the class. They were all 5-years-old. My non-limber, already over-ripe woman’s body towered over a sea of tiny, pink munchkins. I could barely touch the ground, while they could do so with their noses. I quit after the first lesson. When my kids were little, they got a kick out of me singing and twirling them around at the grocery store. When they got a bit older? Not so much. During their mouthy preteen years, nothing got them to behave quicker than me threatening to burst into the opening scene from Oklahoma right there in the produce section. I’d pretty much resigned myself to a musical-free life, but recent events have me reconsidering. I found a pair of tap shoes at Goodwill that were just my size. They’re practically brand new – their prior owner was probably a little old lady who only used them to tap to church on Sundays. If this isn’t a sign from the universe that I am destined for musical stardom, I don’t know what is. So far I’ve only taken them for an introductory spin around my kitchen, but I’m sure I’ll figure out how to tap-dance like a whiz in no time. The next time you’re at the grocery store and it sounds like Shirley Temple is in the frozen foods aisle, who knows? It could be my big debut. My mom is the babe with the dark hair. I’m the kid on the left. I have my mother’s hands. That’s not something I’ve ever taken as a compliment – no offense, Mom. Our hands are broad and short-fingered. A network of lines criss-crosses both palm and back. The adjectives “sturdy” and “capable” come to mind when you see them. They’re milkmaid hands in search of a cow. wrist-deep in noxious substances. As the mother of 9 children she handled more than her fair share of disgusting stuff. Fully 4 little bottoms might be diaper-clad at any one time. Dad helped, but as a stay-at-home mom, the lion’s share of the doody duty fell to her. Mom was a one-woman bomb squad, at least until us “big girls” were old enough to be sent to work in the doo-doo mines. defrosting broccoli. It’s not that Mom was a bad cook; it’s just that the unrelenting drudgery of putting breakfast, lunch and dinner on the table for that many people sucked most of the joyful creativity out of the process. Her go-to menu consisted of hot dogs, frozen broccoli and baked potatoes. In the summer she switched to my Dad’s favorite: corn-on-the-cob and BLTs for almost every meal. up to her elbows in a laundry tub. With 11 people in the house, the mountain of dirty clothes never really wore down. All she could do was take a little off the top of the pile when it threatened to hit the ceiling. Mom spent so much time in our dank basement she should have been a troll. She never complained about it because it was the only place she could go to get away from us. We kids never went down there for fear of being pressed into service carting baskets of clean clothes up two flights of stairs. ink-stained, clutching the edges of a newspaper. My mother is a voracious reader. The Detroit Free Press, the Detroit News, the local paper, the Wall Street Journal – she’s read them all for years. Back in the day, sticky little hands would rip down the newspaper barricade she tried to hide behind before she ever finished an article. Her passions have always been politics, biographies and history. She has been a proud member of the AAUW and their book club for almost 60 years. She is still one of the most widely read people I know. slapping at my Dad’s hand as he absent-mindedly raised it to his mouth to chew on a nail. Mom is the eternal optimist. She remains confident she can break him of this detested habit, even though she’s had no luck in 61 years. wielding scissors. Her passion for current events and politics leads to a need to share. After we grew up and moved away, rarely did more than a few weeks go by without a familiar manila envelope showing up in our mailboxes, chock full of articles. The salient parts are underlined and extra commentary written in the margin. Hers is the voice of our civic consciences, exhorting us to stay informed, to write our congressmen, to DO something to right perceived wrongs in the system. Mom is Jiminy Cricket to all of her little Pinocchios. writing notes. My mother rarely forgets a birthday, a holiday, or a special occasion. She takes the time to pick out just the right card (usually mushy), and then underlines the sentiments that really speak to her. She casts her net wide to keep the far-flung edges of our extended family together. No matter the card, no matter the occasion, the message she is sending is clear: you are special to me. bandaging boo-boos. Over the years Mom has handled more injuries than the local emergency room, not all of them physical. I remember being home from college one weekend when my little sister Judy interrupted us while we were making up a bed. Struggling to navigate the shark-infested waters of junior high school, Judy dissolved into tears at the betrayal of a “friend”. I slipped quietly out of the room, but the image of the two of them seated on the half-made bed remains with me to this day. Judy sobbed on her shoulder while Mom cradled her awkward, adolescent baby in her arms. Her capable hand gently smoothed her daughter’s hair, over and over again. Mom doesn’t wear nail polish. Her hands’ only adornments are her engagement and wedding rings. These are sparkling testaments to her good taste in both diamonds and men. She and my father celebrated 61 years of marriage last summer. A stroke some years back has slowed her down a bit, but at 86 she’s still a force to be reckoned with. She worries that her handwriting is illegible since the stroke, but we all reassure her: “No, your handwriting was always horrible, Mom.” Dad attached a bicycle horn to her walker and she gives it a brisk squeeze if she needs to clear dawdlers out of her path at Big Boy Restaurant. Going out to breakfast is her favorite sport – another of her features I inherited. 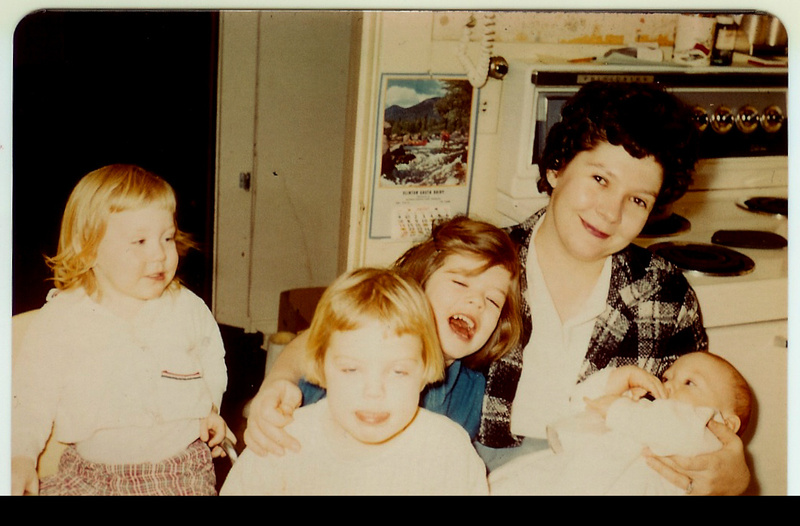 When I look back on life with my Mom I realize I will be lucky if my hands accomplish ¼th of what hers have done. And if mine can hold even a fraction of the love that hers have, I know I will have been blessed beyond measure to have my mother’s hands. It has been a little less than 9 months since my Dad died. Mom “missed her sweetie” and her poor heart couldn’t carry on anymore. With all 8 of us pitching in to care for her at home in her final days, she passed peacefully in her sleep. Nobody could ask for a better death. I love you always, Mumma. Mom, Dad and all their children at our sister’s 60th birthday last year. Our brother Pat is no doubt making devil ears behind all of our heads from his perch in heaven. When empty-nest-syndrome involves the brain. It’s normal to lose your train of thought now and then. If that train routinely jumps the track and crashes in a fiery ball of twisted wreckage, you may have a problem. My husband and I were getting caught up on the day’s events one evening and I mentioned I had run into the father of one of our daughter Liz’s classmates. I shared that the young woman was now married with 2 children and lived down south; Arkansas, Alabama or some such place. “Which classmate?” Bill asked the logical question. Her name, which had been perched on the tip of my tongue mere moments before, immediately flew the coop. “She sat behind Liz in homeroom,” I said. Her face was blurry in my mind’s eye. “Do you mean Erica? How about Becky?” Bill looked at the ceiling, mentally reviewing Liz’s 8th grade class roster. “Is it Cassie? Natalie?” He ticked off possible candidates on his fingers. “Those two were blondes,” I scoffed. Was this the best he could do? “She was the only one who didn’t get a gutter ball when we took the Brownies bowling in 2nd grade.” Chances were slim that Bill remembered Liz had been a Brownie twenty years ago, but I was clutching at straws now. “I think there’s an “A” in her name. YOU know who I mean,” I insisted. “Abby? Anita? One of the Ashleys?” A hint of desperation had crept into his voice, but he soldiered on manfully in the face of almost certain failure. “They didn’t have an Anita!” I exhaled loudly. This was pointless. A forgotten word is a shy creature. It hovers just out of reach and darts away quickest when chased. Names are the worst, as I know from increasing experience. They cannot be wooed; they will not be coerced. They alight only when and if they so desire, usually when you have given up all hope of catching them. We sat in silence for another 10 minutes engrossed, in varying degrees, in a fascinating PBS documentary on the three-toed sloth. The elusive name came home to roost at last, flitting back into my brain as suddenly as it had left. “Stella!” I exclaimed, shooting Bill a triumphant smile. He stared back at me blankly. “Huh?” he asked, clueless. Having trouble remembering things doesn’t necessarily signal early dementia, but I think it may be time to get a professional opinion. Bill’s memory is clearly going to pot. Do you have lovely eyes? A noble nose? An infectious smile? Sometimes it’s hard to see our own outstanding features, even if they are obvious to everyone else. That’s because some of us can’t see beyond the big, invisible labels on our foreheads. I dismissed that idea as quickly as it occurred. I’m not the “singer” in the family. That’s Judy, Libby, and Bill. I’m the “smart” one. Kids are assigned their roles very early in life. Maybe you could read before the other kids: you’re “smart”. Maybe you walked and ran easily: you’re the “jock”. Maybe you kept your crayon scribbles inside the lines: you’re the “artist”. Maybe you cried or raged or couldn’t sit still: you’re the “difficult child”. Our first labels come from our families. These are honed when we get to school and new ones are added. Those early labels have a way of sticking. I liked being thought of as “smart”. Having that reputation makes school easier. There may not really be a “permanent record” that follows you from grade to grade, but teachers hear things. They’re only human. When they expect you to do good work, they give you the benefit of the doubt. Don’t get me wrong – I’m no Einstein. I’m reasonably intelligent but, as I discovered as I started swimming in bigger ponds, there are a lot of smart fish in the sea; many are lots smarter. But that was the label I was given as a child and it stuck, inside and out. “Smart” was great, but I wanted to be other things, too. In junior high and high school, I would have traded all my “smart” for “pretty”, “popular” and the Holy Grail of teenage labels, “cool”. I secretly longed to try out for our high school’s musicals, but I was scared. Besides, I wasn’t a “singer”. “Singers” took chorus. I took band. All the “cool” kids were in chorus and they got all the parts in the plays. My place was in the orchestra pit with the rest of the “band nerds”. 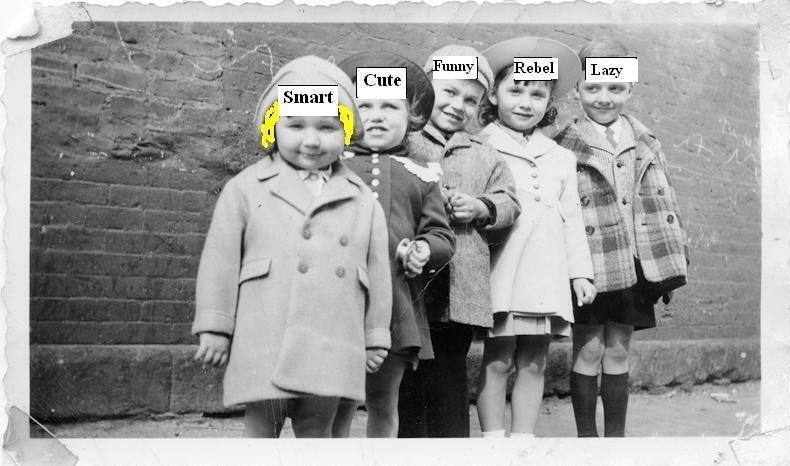 If being stuck with a label like “smart” can be limiting, how much worse are the labels that demean and hurt? Labels like “troublemaker”, “lazy”, “stupid” or just plain “bad”. That’s the kind of attitude that can define your entire life if you let it. Jim didn’t let it. In the early years he may have internalized the labels that the school stuck on him, but somewhere along the line he ditched them. Jim defined himself. He got a degree in business, worked for a few years and then decided to go to dental school. The “goof-off” is the only one of us nine siblings with the title “Dr.” before his name. Labels can be a convenient shorthand to identify strengths and weaknesses, but should be used carefully. We have to guard against the tendency to limit ourselves – and others – to the neat, little pigeonholes we’ve become accustomed to. After all, you’re not free to fly if you’re stuck in a pigeonhole. p.s. As with all my siblings, my sister Libby can proudly wear many labels advertising her many strengths and talents. But the label associated with her for life is from a commercial for canned goods from our youth. I can still hear that jingle in my head because we sang it at her ad nauseam, “When it says Libby’s, Libby’s, Libby’s on the label, label, label, you will hate it, hate it, hate it on the table, table, table…” Sorry, Lib. p.p.s. In case you’re wondering; no, I’m not joining the church choir. I’ll let my voice soar from the safety and anonymity of the pew. Forty years ago today, I thought the end was near. I found myself confronted by a pack of snarling, howling, wild animals; a metal mesh gate the only thing separating me from certain disembowelment. I had armed myself, but doubted the institutional gravy ladle clutched in my trembling hands would be up to the task. The Great Blizzard of 1978, also known as the White Hurricane, was a historic winter storm that struck the Ohio Valley and Great Lakes regions from Wednesday, January 25 through Friday, January 27, 1978. According to Wikipedia, up to 40 inches of snow fell. Winds gusting up to 100 miles per hour caused drifts that nearly buried some homes, and wind chill values reached −60 °F across much of Ohio where 51 of the total 70 storm-related deaths occurred. About 100,000 cars were abandoned on Michigan highways, most of them in the southeast part of the state. I was a freshman at the time, at a tiny college called Northwood University in Midland, Michigan. My roommates were from the Caribbean and South America and one girl, Hilda, had never seen snow. On day one of the storm she dragged me outside for a little stroll. While I have nothing but admiration for Ernest Shackleton’s intrepid journey to Antarctica, he’s got nothing on Hilda and me. It took a full hour to go around our small dorm building through waist-high snow. More than once I cursed our lack of adequate preparation – we had not thought to bring a rum-toting St. Bernard on the expedition. The dorm was a 50s-era, dull pile of cinderblocks that always smelled faintly of gym shoes and boiled cabbage and I was never so glad in my life to be someplace than when we made it back inside alive. But the worst was yet to come. I had a little part-time job at the college working food service for banquets. I once served Arthur Godfrey a plate of lukewarm chicken, potatoes and green beans! That should impress the people over 65 who know who he was. My regular gig was serving breakfast to the Sunrise Optimists Club. They met in the banquet hall every Tuesday morning at, you guessed it, sunrise. My parents took it as a promising sign that I, the world’s most notorious over sleeper, would be getting up and at ‘em BEFORE 6am so the Optimists could have fresh coffee, blueberry cake donuts and powdered scrambled eggs that were cooked in sheets, then folded and cut into squares so they looked like yellow versions of your grandpa’s handkerchiefs. It was a paycheck. I didn’t work in the cafeteria, though – they had regular employees for that. On this day, forty years ago, the whole college was shut down. Hell, most of the Midwest was shut down. That meant that none of the grups (grownups in Star Trek-ese) who were paid to take care of us pampered college students could make it out to campus. We were on our own. The students had to be fed, so any and all of us who worked in the kitchens and lived on campus were pressed to help out. We were like the National Guard of food service, called to action because the regular food service army was off fighting at the front. Our leader was an older student who had worked there the longest – she was a sophomore. She set us to work opening 20-gallon cans of green beans and 50-pound boxes of instant potatoes, trying to cobble together enough to feed the gathering throngs. I was totally out of my element here. What did I know about cooking? My expertise lay in brewing coffee and arranging blueberry donuts on trays. The students were gathering, within sight but just out of reach in the dining hall. It was separated from the kitchen by one of those metal accordion gates they put across the front of liquor stores in bad neighborhoods. How appropriate. It has been a constant through history: when confronted with seemingly insurmountable obstacles, mankind has risen to the challenge with almost super-human effort. You hear about mothers lifting cars to save their infants trapped beneath. So it was during the Great Blizzard of 1978. 100,000 cars stranded throughout the state, emergency crews helpless in the face of mountains of snow, yet more than one intrepid student had found his way through the blizzard to seek vital supplies. Apparently a liquor store was open a mile away. By day two of the catastrophe, fully half the student body was drunk. When authority is removed, you find out who you are as a civilization. Do you rise to the occasion and work as one? Or does society break down? Dinnertime at the Northwood cafeteria was like The Lord of The Flies. As we worked frantically to figure out how to feed the animals at this zoo of higher learning, the inmates grew increasingly restless. They pressed up against gate, some shaking the flimsy barrier. They raised their voices, demanding in slurred accents, “Where’s our dinner?” They had become a drunken, unruly mob. I was, frankly, terrified. So many kids were smashed, I didn’t know if they would listen or become an even uglier mob. It was touch and go. Then the mob turned back into students and shuffled away from the gate. I don’t remember much about after those tense moments, but the girl in charge opened up and we got everybody served something to eat. It seemed to help having a little food in their stomachs to absorb the alcohol. After dinner I scurried back to my dorm room and didn’t come out for 2 days when the grups were back and order had been restored. I lived off blueberry donuts purloined from Optimists breakfasts of old. Forty years later, I look back at The Great Blizzard of 1978 and laugh, but I still carry the scars of that momentous occasion. The smell of blueberry donuts makes me break out in a cold sweat. Did you live through the Great Blizzard of 1978? What is your most vivid memory? A picture print by Currier & Ives. I’m just about done with whatever preparations I’m going to make for Christmas and I’m ready to let the celebrations commence. If you didn’t get a card from me by now, chances are you aren’t going to, especially since I sent out exactly one. Sorry. You may have also noticed I didn’t send any homemade goodies. Don’t feel bad. I didn’t bake anything because I have a serious sugar addiction. I am already fighting off the dreaded holiday 5 pound gain and falling into a sugar-induced coma each night from all the goodies that appear at my office and call out to me with their siren song, “Eat me! It’s the holidays…it’s ok. Eat me!” In a good way. I can’t have that stuff in the house. Sorry. My husband, Bill, went up to Chicago to have some melanoma spots taken off his back yesterday. The doctor said it was very early stages, so no worries. Except of course it is worrisome. Melanoma is real cancer, not just old sunburn spots. And he had a pretty big, pretty serious melanoma spot removed from his arm almost 9 years ago. You know how doctors say “you’ll feel a little pinch” when they’re about to hack off a major body part? That’s what they told him, but after 2 hours of digging around, when the local wore off he said it felt like somebody shot him in the back. They gave him a couple Tylenol. He’s a trooper. Despite the pain he hung around the city all day so he could pick up our youngest, Gwen, from the airport in the evening. Gwen is home from California and we had a nice catch-up chat late last night. I left her my car today and she’ll come fetch me so we can have lunch. Liz will be coming home tonight from Iowa. I am so happy and thankful that we will have both of our little chickees home under our roof. We are all going to dinner tonight with a family who are dear friends. Then, tomorrow, Bill’s sister is coming from Indianapolis, and our niece and her family are in from New York. We’ll have dinner Friday night with Bill’s family, and how wonderful it will be when we are together. Saturday we leave for Michigan. I haven’t missed a Christmas at home in 58 years. I know. Can’t wait to see most of my dear family. We’ll miss those who can’t be there, especially my dad. My dad died a couple of months ago. This will be our first Christmas without him. The in-town sibs have been dealing with the everyday loss since then, my mom most of all. But I’ve been able to push the thought to the back of my brain. When I talk to Mom, I can fool myself; Dad just can’t come to the phone right now because he’s engrossed in a fascinating PBS special in his den. Being home for the first time since the funeral, there will be no getting around this new reality. I was in the bathroom today and looked up at the mirror, casually, and discovered I had smudged mascara all under one eye, like a 6-year-old playing with mommy’s makeup. It reminded me of my Grandma Corrigan. She was always dressed to the nines, as the expression goes, with full makeup, nice dresses (I never saw her in pants, not once my whole life) and frilly, frosty hats, usually pink. The waitresses at the Big Boy, her favorite restaurant near her apartment when she moved up to our town from Detroit in her later years, used to call her The Pink Lady. She never relaxed her standards. As her eyesight started to go, she couldn’t see to apply makeup and she would have drifts of Coty face powder in Ivory Beige caking around her nose. She didn’t know it. The thought of that vulnerability makes me cry. My mother’s favorite restaurant is now the Big Boy; it’s the one on the opposite side of town from her mother’s spot. She sails in with her walker, but she doesn’t wear dresses or frilly hats. Her makeup still looks good, foundation but no powder, and she has never worn mascara. She doesn’t have to worry about it smudging all under her eye like her daughter does. What is it about this time of year that makes me so happy and yet, so sad? One of the best things about Christmas is the music. I do not mean Michael Jackson screeching “Santa Claus is Coming To Town.” I grew up with the Jackson 5 and I love them. But if I have to hear that song one more time, blaring every time I get in the car since most of the local radio stations who usually play classic rock abandoned that beloved format a month ago in favor of sloppy, self-indulgent mega-trilled covers of beloved Christmas classics done by modern singers. OK, Mariah Carey, you’ve got a hell of a vocal range. I get that. But do you have to land on every mother-lovin’ note in the scale for every mother-lovin’ note in the song? Sing “Silent Night” like it was written, I BEG you! I am talking about the music of Bing Crosby, Eartha Kitt singing “Santa Baby”, and especially “Sleigh Ride.” My dad has a green 33 record (kiddies, ask your parents what those are) of the Boston Pops playing Christmas songs. When that record went on the record player and we heard those jingly bells and the whip crack at the end, it meant it was really Christmas time. I mean he HAD a green record. Damn. This is going to be hard. Anyway, I am wallowing in the glorious sounds which man has been inspired to craft to express his joy at the Savior’s birth. I’ll leave you with John Rutter’s arrangement of “What Sweeter Music” for the King’s College Cambridge Singers. It moves me to tears. Hope this is a blessed, happy Christmas for all! At this joyous time of year, many of you are sorting through your stash of previously received lame gifts, searching for likely candidates to regift. In that same spirit, I am regifting a classic Christmas story from blog years of yore. Little Red Peg taking care of Christmas business. Once upon a time, Little Red Hen lived in a cozy little coop with her happy little family. 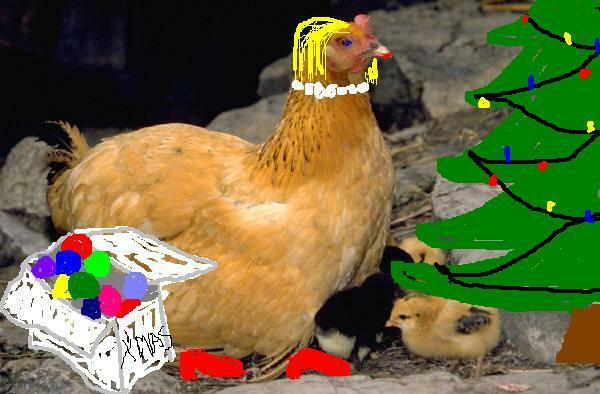 It was Christmas time and Little Red Hen thought some decorations would add to their holiday joy. “Who will help me set up the tree?” she asked. “Not I”, said the rooster. “Not I”, said the first chickee. “Not I”, said the second chickee. “Then I will do it myself,” said Little Red Hen. And so she did. Amidst a considerable amount of swearing. Little Red Hen developed tree burns and little cuts on her wings from wrestling the 9-foot tall, artificial tree out the box, putting it all together and fluffing the scratchy branches. “Who will help me put all the lights on the tree?” she asked. “Then I will do it myself”, said Little Red Hen. And so she did. With nobody to hand the strings of lights to, she was up and down the ladder at least 26 times. All the lights worked when she tested them, but half of the strands went out as soon as they were all plugged together. “Who will help me put all the ornaments on the tree?” she asked. “Not I” said the rooster. “If you think I’m doing any more decorating without any help from you selfish, lazy slobs” said Little Red Hen, “you’re crazy!” She burst into tears and took off for the mall with a squeal of tires. The rooster and the 2 little chickees ate all the cookies, drank all the egg nog, turned off the Bing Crosby CD and watched Game of Thrones reruns on TV. And the half-decorated tree and 3 big boxes full of ornaments are still sitting in the middle of the living room floor to this very day.